In a system that claims to care about schoolchildren, it's unconscionable that special needs classes are sitting around in a scorching heat wave with no air-conditioning. I'm lucky to work in a school where that doesn't happen quite as frequently as it does elsewhere, but good intentions are no substitute for modern electric wiring. I've therefore found myself in sweltering miserable classrooms as recently as last year. I'm in Ontario now, and I wouldn't subject my dog to what the system puts these kids through. 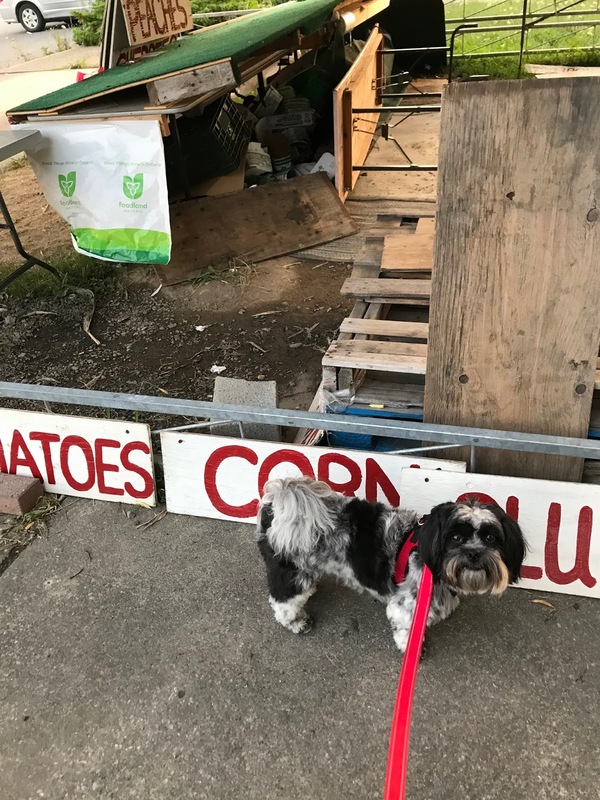 You can see him in the picture at a fruit stand, saying I'm not gonna eat any of this stuff and asking why I brought him here. Granted, I love my dog, so I'm off on a quest to find him Freshpet dog food here in Ontario. But jeez, don't we love our children? Shouldn't they be treated with the same consideration I give my dog? There are certain fundamentals in education. One is, that in a miserably hot classroom, it is incredibly hard to concentrate. I'd like to just blame kids for that, but the fact is it's as hard for me as it is them. How do you focus on some story about other people when all you can think about is how soon can I get out of here? If it's hard for us, it's harder for kids. I'm not an expert on special-needs kids but it's not a big stretch to say it's at least as hard for them. Maybe the city feels that special needs somehow preclude basic human needs. Hard to say, since I work every day instead of sitting around Tweed somewhere. I didn't speak at my very first Executive Board meeting. I wanted to bring up air conditioning in schools. I can't remember why my colleagues talked me out of it. I do recall, though, a few months later, the city saying it would place AC in all classrooms at some point in the future. I have news for the DOE--the future is now, and you're leaving children behind. My daughter went to some summer program in a nearby elementary schools when she was very young. On extremely hot days, we'd get a call. Don't bother coming in. We're not making kids sit in miserable hot classrooms on days like this. That makes sense to me. Of course, NYC would never do such a thing, even though it wouldn't hurt anyone, even though keeping the kids in classrooms is likely as not making them hate school. Did you know that New York City has a protocol for a delayed opening? I remember hearing about it when it started. It was utilized exactly once, when there was a transit strike. All those years, when you drove to work with cars crashing to your left and right, when Carmen Fariña discussed how beautiful the day was with her chauffeur, the city could have eased things not only for you, but also for 1.1 million schoolchildren. They didn't, of course, because if Carmen's chauffeur could come in, why couldn't the kids? They could easily have booked limos just like Carmen did. Teachers? Them too. Granted, Bill de Blasio seems to have learned from Carmen's amazing lack of perception for the obvious. He now closes schools when there are raging blizzards. He doesn't even wait until 5 AM like Klein used to do, because he seems not to be a small-minded, nitpicking, self-serving automaton concerned solely with his own advancement. That's a step forward. Nonetheless, we can do better. Years ago, I installed central AC in my home. I see how my dog reacts when it's above 90 outside, so don't turn off the AC when the dog is home alone. Now I work every day, so I have no idea what the thinking is at Tweed, if indeed there is any. This notwithstanding, the AC at Tweed should be turned off every single day until every city kid is learning in a comfortable environment. If we wanted to torture children, we could just dump them into Moskowitz Academies. But we don't want to do that, do we? And if that's the case, New York City's children deserve at least the same consideration we dog lovers provide our canine companions.